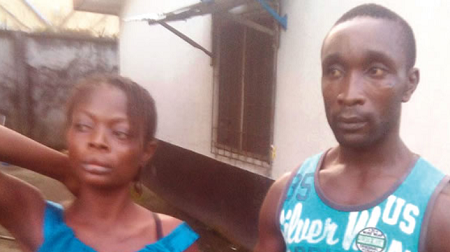 A couple has been arrested by operatives of the Inspector-General of Police Monitoring Unit in Afam, in the Oyigbo Local Government Area of Rivers State, for selling their day-old child for N250,000. The couple, Richard and Chidinma Benson, however, said they sold their baby to enable them to leave their village in the Isiala Ngwa North LGA of Abia State to seek better life in a town. Chidinma had reportedly been delivered of a baby boy at Graceland Maternity Home in Afam on October 7, 2018, and she allegedly sold the baby to one Rose Onyia. It was gathered that the baby was later resold to another child trafficker, identified as Eucharia Jaja, for N550,000 after which the infant was sold to an unnamed person in Lagos. The couple told Punch Metro that poverty led them to sell the baby, who they said was their fourth child. Chidinma said, “We sold our baby to one woman (Rose Onyia). I have four children and one is late. The baby was one day old when we sold him for N250,000. I did it with my husband’s approval. Her husband, Benson Richard, confirmed that they were almost dying of poverty when they decided to sell the baby so that they could leave the village. “Information further revealed that on October 7, 2018, Chidinma was delivered of a baby boy at Graceland Maternity Home, Afam. The maternity home is owned by a quack nurse called Grace Daniel.